THIS IS A DALE EARNHARDT JR. #8 BEAR BANK. 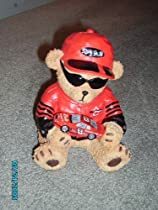 THIS ADORABLE BANK HAS THE BEAR WEARING A # 8 HAT AND RED SHIRT (THESE ARE PAINTED ON NOT CLOTH) AND HOLDING THE #8 CAR THE BACK OF THE SHIRT HAS DALE JR. ON IT AND THE HAT HAS AN 8 ON IT, THE SLOT IS AT THE TOP OF THE HAT SO YOU CAN PUT YOUR EXTRA CHANGE IN IT AND THE BOTTOM HAS A REMOVABLE RUBBER STOPPER TO REMOVE YOUR CHANGE. THIS IS MADE OF POLYRESIN AND MEASURES APPROXIMATELY 6 1/2″ HIGH AND 5″ WIDE AT THE BOTTOM. THIS IS FROM WINNERS CIRCLE AND IS AN OFFICIALLY LICENSED NASCAR PRODUCT.